Our custom designed cap comes with beautiful raised embroidered NewsmaxTV in blue and red. This durable cap is made of 100% algodon cotton. It's designed for comfort with an adjustable plastic band strap in the back. The hat is white with blue and red lettering. 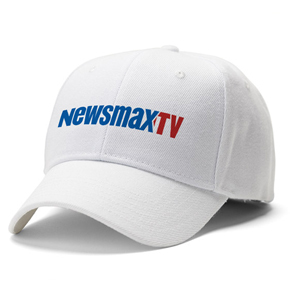 Wear this NewsmaxTV cap just about anywhere!